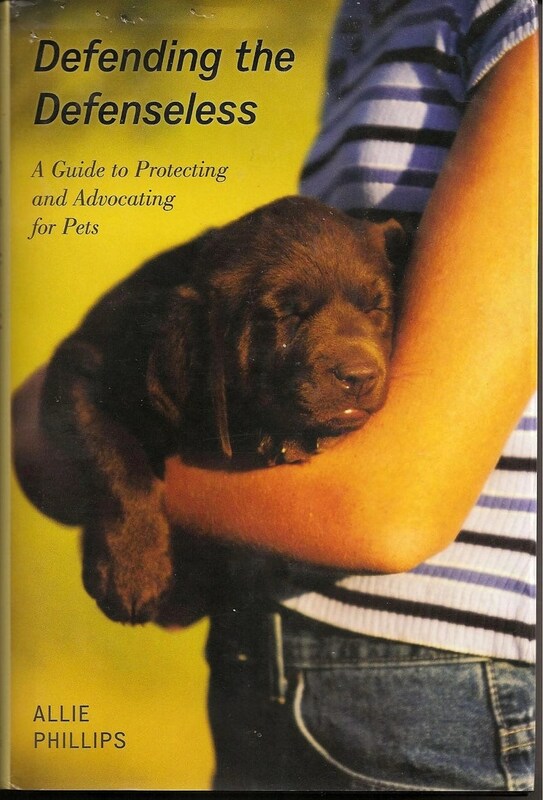 Defending the Defenseless, A Guide to Protecting and Advocating for Pets is almost several books in one, one telling the story of author Allie Phillips’ knowledge of animal laws and regulations, another outlining effective advocacy, marketing and public relations strategies that shelters and animal rescue organizations should use; another advising shelters and animal rescue organizations how to avoid compassion fatigue, success stories of various organizations, and the culmination in each chapter “You Can Do More”, whether it’s parents, kids, shelter workers, teachers, shelter and rescue workers or the general public. The 278-page-book, published in 2011 by Rowman and Littlefield Publishers, Inc. is not a quick read. It is loaded, and loaded with tons of information that would be useful to anyone in the shelter world. There’s also segments sprinkled in throughout the book where youths or adults aspiring to work in animal related professions can look beyond the world of veterinary science to animal care education, animal therapy, and more. In Chapter 1, she starts off citing statistics on how Americans feel about animal welfare, she cites that 28 percent strongly support and 41 percent somewhat support the goal of minimizing and eventually eliminating all forms of animal cruelty and suffering. She goes into great detail to explain the difference between animal rights and animal welfare. The first eliminates any idea that there’s some appropriateness for certain actions. Whereas animal welfare advocates understand that animals should be protected from harm but not equal to humans. The Animal Defense Fund has created an Animal bill of Rights that it has submitted to Congress which includes the right of animals to live free from exploitation, cruelty, neglect and abuse. Establishing goals and understanding that those in shelters and rescue organizations cannot help every animal. They can only help one animal at a time is key to avoiding compassion fatigue. This book is so full of information that it’s difficult to cite specifics. Allie Phillips is an attorney by profession, and her path that led her from criminal prosecution to defending the animals. In Chapter 6, she deals with Models for Thriving Animal Organizations: Saving More Lives through Innovation. She quotes Tracy Coppola, former policy and government affairs associate for the American Humane Society, who spent two years, 2008-2009 researching a paper Examining America’s Pet Overpopulation Crisis, Controversy and Solutions. She says a no-kill shelter ideally is a shelter that is able to save all the healthy, adoptable and/or treatable animals from euthanasia. Phillips continue on saying that shelters in the United States take in 8 to 9 million animals every year with about four million being euthanized. That’s about half. With the financial crisis of 2008 – 2010 those number have most likely increased because so many surrendered their animals to shelters because of economics. The No Kill Advocacy Center was started to help shelters re-think housing and re-homing animals. The Center has created a model for change the No Kill Equation, education no-kill legislation through conferences and books including Redemption, Irreconcilable Differences: The Battle for the Heart & Soul of America’s Animal Shelters. While Americans are becoming less tolerant of senseless euthanasia and an epidemic of pet overpopulation, they are at the root of the problem because they don’t spay/neuter their pets, and treat them like disposable objects. The shelters aren’t creating the problem. People are. Yet shelters are left to deal with the problem. The unpredictability of the numbers of animals going to shelters every day is a daunting problem. San Diego Humane Society President Dr. Mark Goldstein has an innovative theory on the dilemma. Much of it is messaging, the core of a good public relations campaign. They have not euthanized a healthy, treatable animal since 2001, and they’ve helped more than 38,000 animals a year. He believes in first improving the lives of animals in the community, rather than focusing on adoptions and euthanasia. Adopting out of love rather than desperation. To help people cope with and address social and behavior issues, reasons for surrendering their animals to shelters. Making spaying/neutering commonplace, regardless of where someone resides. Working towards a day when the only animals coming to shelters are seriously ill or dangerous. Low cost spay/neuter programs should be affordable or subsidized, Low cost has no value and sends the wrong message. Animal control should be called animal services, to stop focusing on control aspect if animal welfare and focus on the services that people can provide to help animals. Shifting terminology from rescue to adopt, not saying rescued a cat from a shelter, but adopting a cat from a shelter. When animals need to be rescued it conjures up thoughts that it’s a bad place. They’ve created a welcoming environment and showcasing animals. They have become the San Diego Campus for Animal Care, going from the pound which infers going to jail, to shelter inferring they only shelter animals, to village, which infers community involvement, and finally to a campus, a place that signifies education, learning, excitement and a place people want to visit. The County of San Diego Department of Animal Services (formerly animal control) is on one side of the campus, and the Humane Society is on the other. One thing that stuck with me was his statement about people’s attitudes that shelters were depressing. He creates positive energy, with a waterfall and Rocky’s Café greeting people as they enter the campus. The staff wear name tags and are smiling, projecting the el of a place where people come to fall in love with their furever pet, not just take an animal to save it’s life. As a communication, public relations professional, I can’t emphasize this paradigm enough. Pathos works to raise money, but does it work to re-home animals? If people are reluctant to adopt from shelters, they’ll look elsewhere, and perpetuate the myth: Why spay/neuter my pet when I can always find a home for the new kittens or puppies…..
One blog entry or book review cannot scratch the surface of the incredulous amount of information in this book. She talks about setting up a rescue organization, effective advocacy, educational resources, emergency preparedness, laws, transporting animals to areas where they could be more readily adoptable. Eliminating euthanasia in gas chambers, which can take up to 30 minutes for the animal to die, and using the more humane injections by … which only takes a few minutes. by injection which can take up to 30 minutes for the animal to die. The ensuring screams and tearing wear at shelter workers or anyone that witnesses this horror, saying it is inhumane and cruel. Yet … states still allow euthanasia in a gas chamber. This book is extensively informative, uses some challenging vocabulary at times, and is full of legal information. However, it should be a must read for anyone serious about animal rescue, dedicating their career or volunteer efforts to bettering the lives of animals and curtailing abuse, neglect, hoarding, puppy mills, and reducing the number of animals that are surrendered to shelters every day. What do you think about changing your messaging? Have you been affected by these inhumane practices like pound seizure or untimely euthanization? What do you think can be done to defend the defenseless? Take a few minutes to share your thoughts and experiences. Previous story Wordless Wednesday: Who did your cat vote for?